Sriram Krishnamoorthy is one of many scientists reaching for the next step in supercomputer evolution, the exascale computer. In April 2013, DOE awarded him $2.5 million over five years to explore ways to advance exascale computing through their Early Career Research Program. Dr. Sriram Krishnamoorthy was one of 61 DOE Early Career Research Program award recipients in 2013. With the award, Sriram will pursue "Concrete Ingredients for Flexible Programming Abstractions on Exascale Systems," which will fundamentally transform exascale programming models and runtime systems for scientific applications via the design and characterization of algorithms that automate concurrency, data movement, and resilience management. Today's top supercomputers can function at the petascale level, performing in one hour what would take a typical laptop more than 20 years to do. Exascale computing will provide a thousand-fold increase in computing capability that can be applied toward solving crucial energy and environmental problems. Sriram has been studying ways to make computers better at accommodating the rigorous demands of parallel computing, where machines perform different parts of calculations simultaneously, sometimes on different kinds of computer hardware, and put all the pieces back together on the fly. He also has found ways to automate processes that translate equations that work on conventional machines into computer language and styles used by parallel computers. His need to enhance the flexibility and capability of computing systems also has pushed Sriram to create tools that allow programmers to write code in modules that can be automatically matched to different computing platforms, making it easier to customize programs to different systems. His work with fault tolerance also has led to creating programs that identify just the work lost due to a fault and only redo that portion - rather than returning to the last good checkpoint. With the support from the DOE Early Career Award, Sriram will delve deeper into how parallel computing solves problems, assuring that the different pieces of the full calculation are working as efficiently as possible. After building the understanding of when and where certain approaches work best in different programs and platforms, he will test how they will perform on future extreme-scale computer systems. 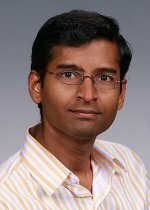 For more information about Sriram's DOE Early Career Award, see the PNNL news item "PNNL's Krishnamoorthy earns one of Energy Department's 61 Early Career Research Program awards."